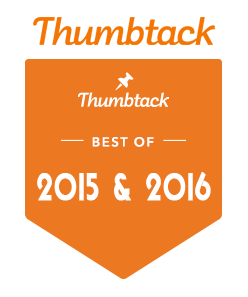 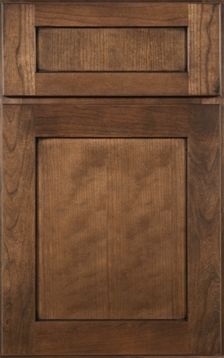 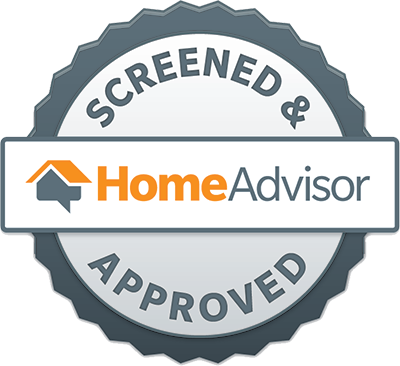 Jon & Kathy called New Leaf after researching local cabinet makers and remodeling contractors online. 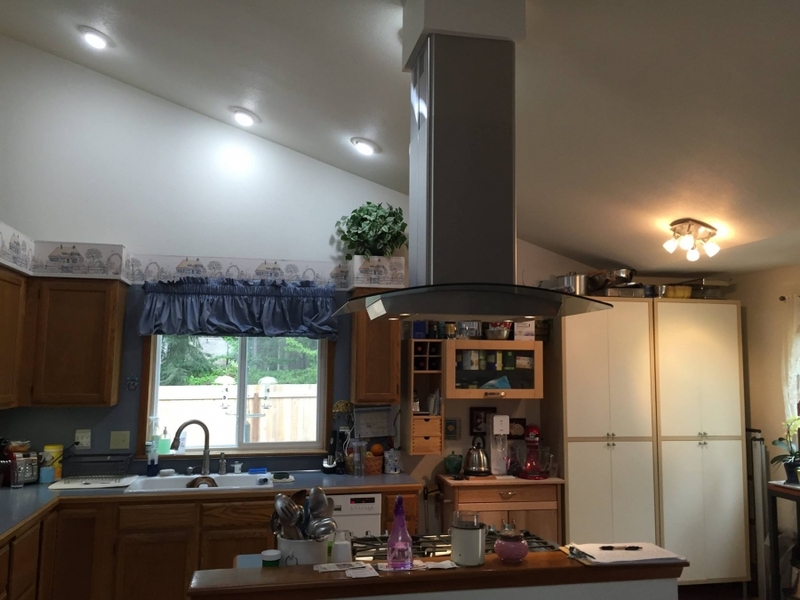 They were looking to update their kitchen which hadn't been touched since it was built in the 1980's. 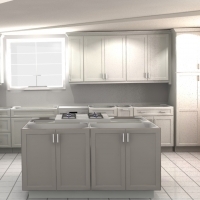 Kathy expressed complete disgust with the lack of storage in her average sized kitchen. 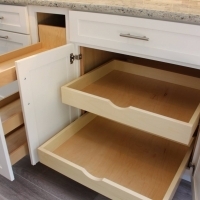 The old cabinetry was not only dated, but with 3/4 side mounted drawer guides, the few drawers that she did have operated poorly and had little space. 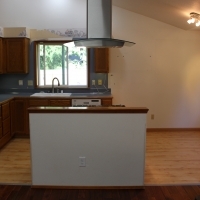 Shane not only listened to Jon and Kathy's concerns, but also took stock of the items that were stored poorly. 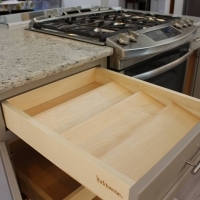 Items like both small and large spice containers, baking sheets, and dry goods. 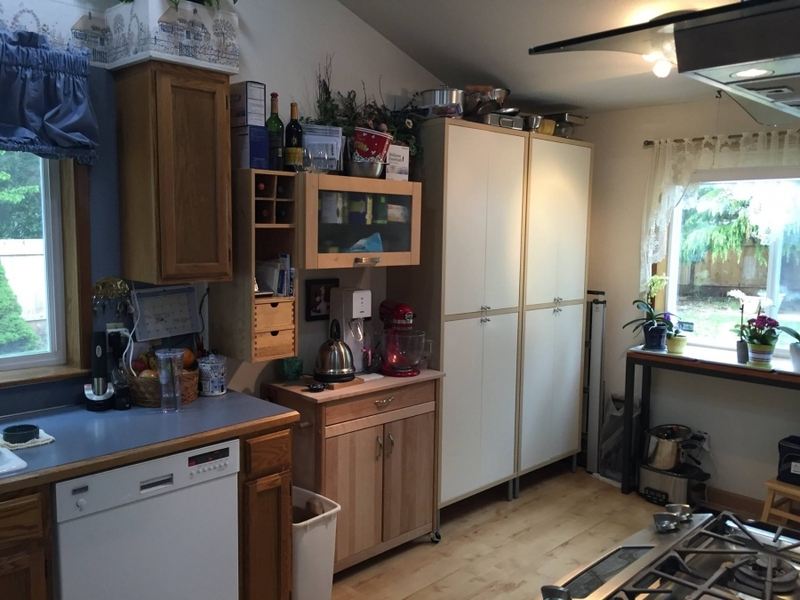 Shane knew that he had to make the most out the kitchen layout. 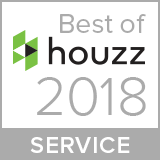 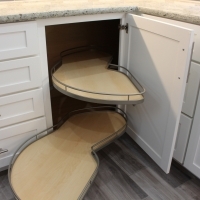 He started by replacing their dead corner cabinet with a cabinet that contained a blind corner pull out that allows full access to items hidden in the typically dead space. 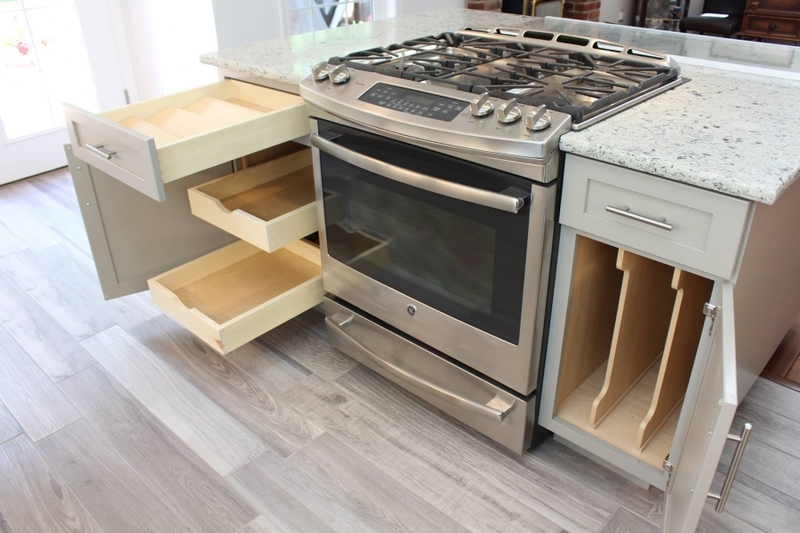 He then incorporated a spice tray into the drawer next to the range for all the small McCormicks style spice bottles and also added a pull out spice rack with adjustable shelves for the bulk spices. 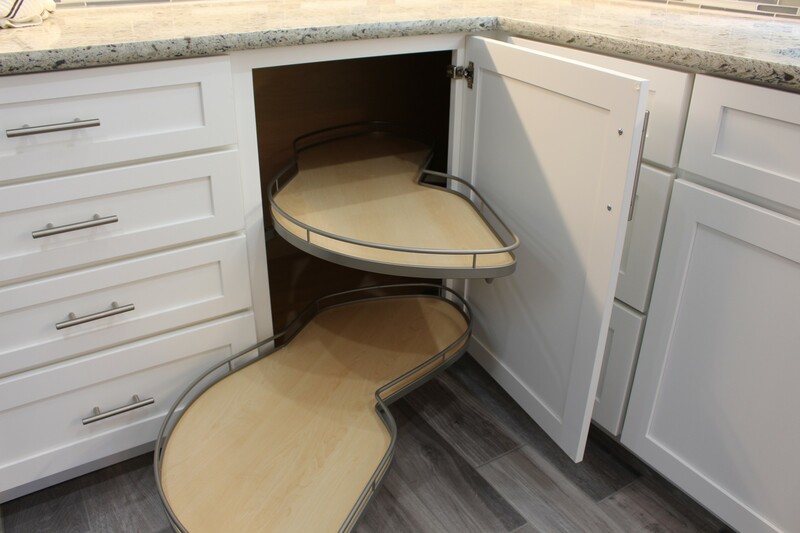 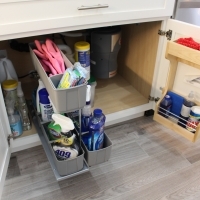 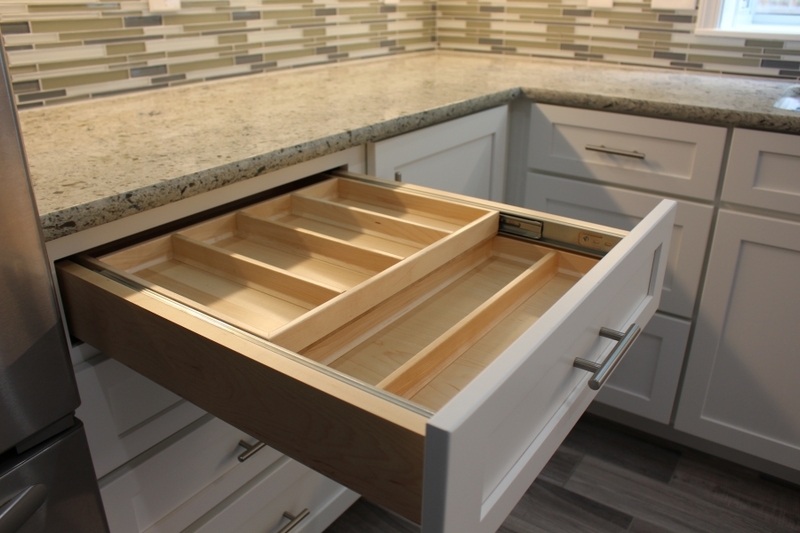 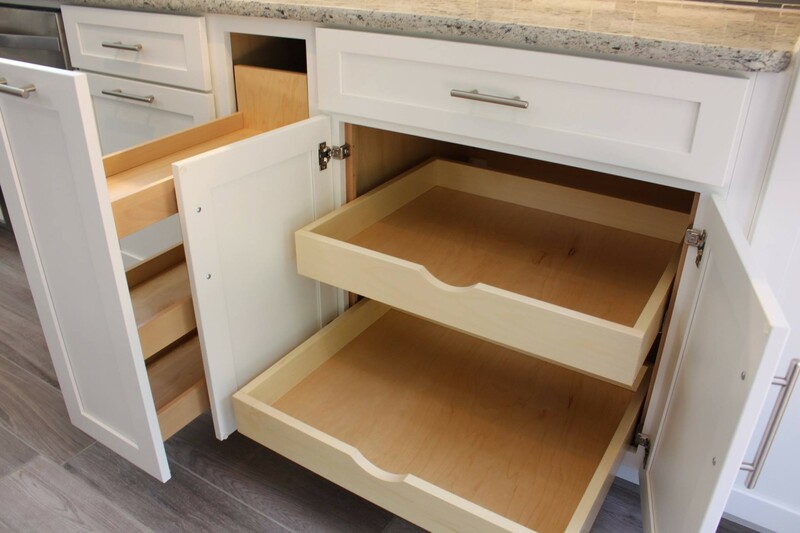 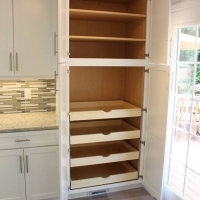 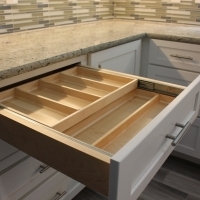 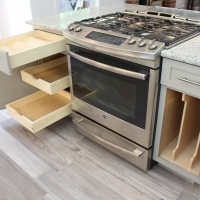 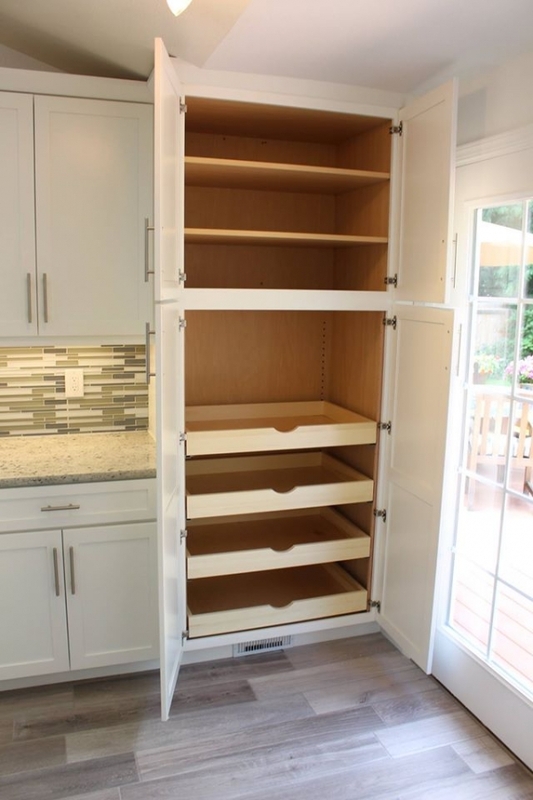 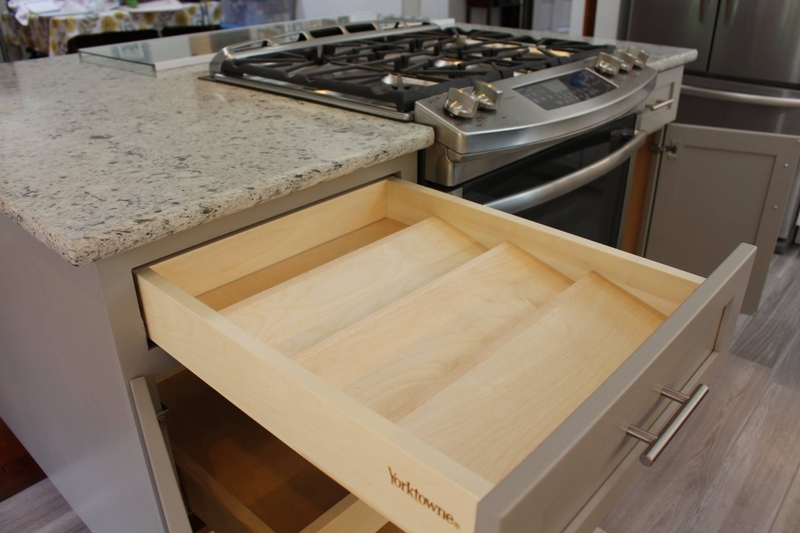 A tray divider cabinet and tiered cutlery drawer were added to maximize space. 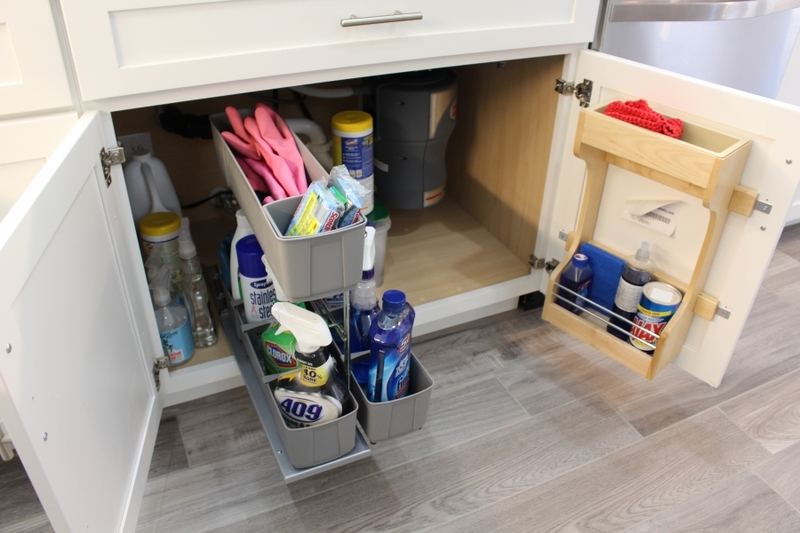 To the right of the sink he included a dual waste basket pull out cabinet to keep the trash cans out of sight. 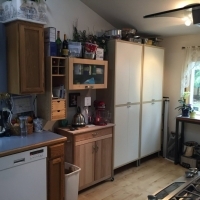 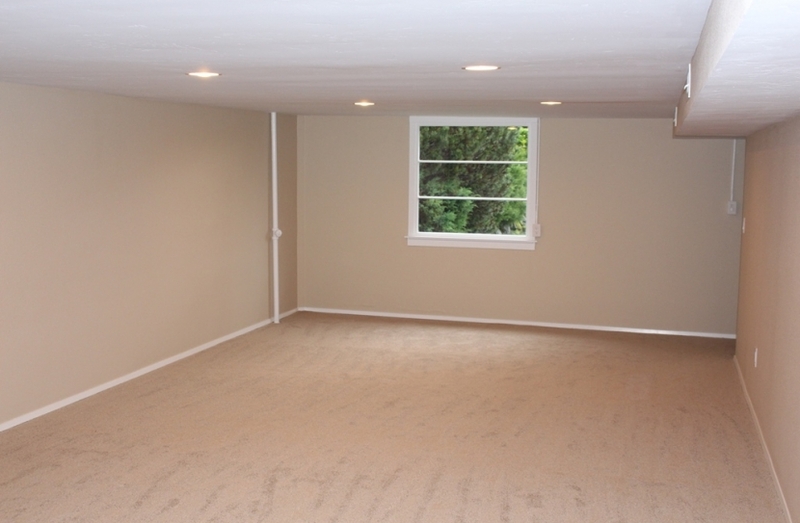 He also added a nice wide, full depth, floor to ceiling pantry, complete with four heavy duty roll out shelves capable of supporting 94 pounds each! 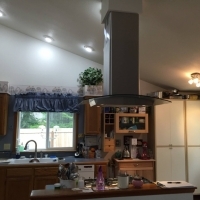 He topped the entire kitchen off with matching crown molding for the finishing touch. 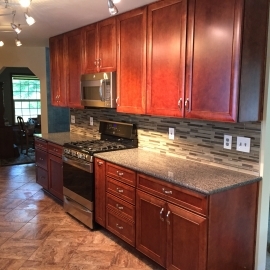 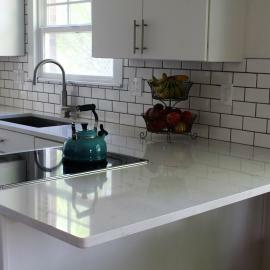 Both Kathy and Jon wanted a natural looking countertop, but didn't want to have to deal with the maintenance of granite. 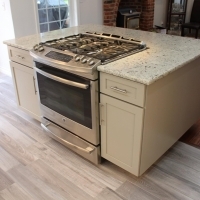 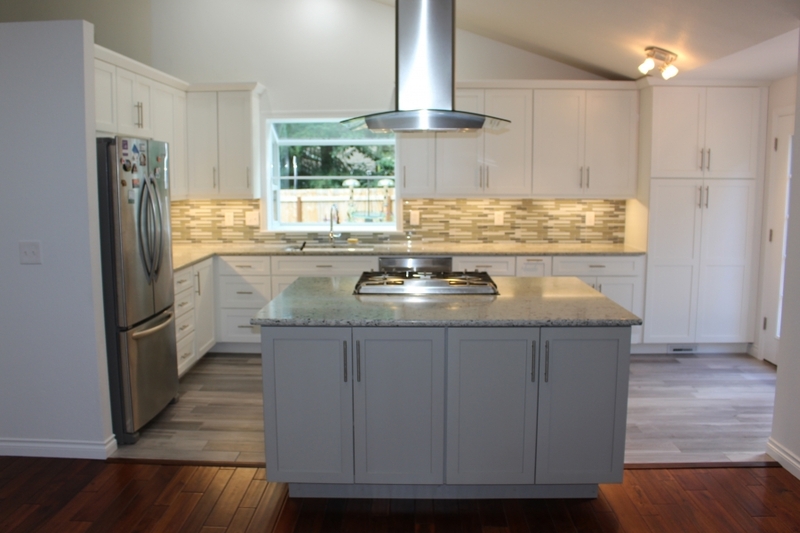 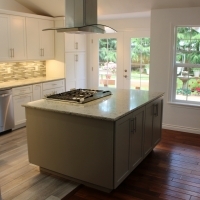 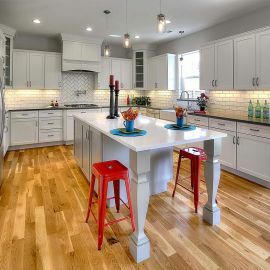 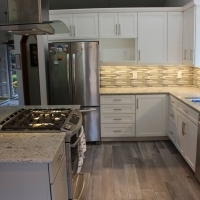 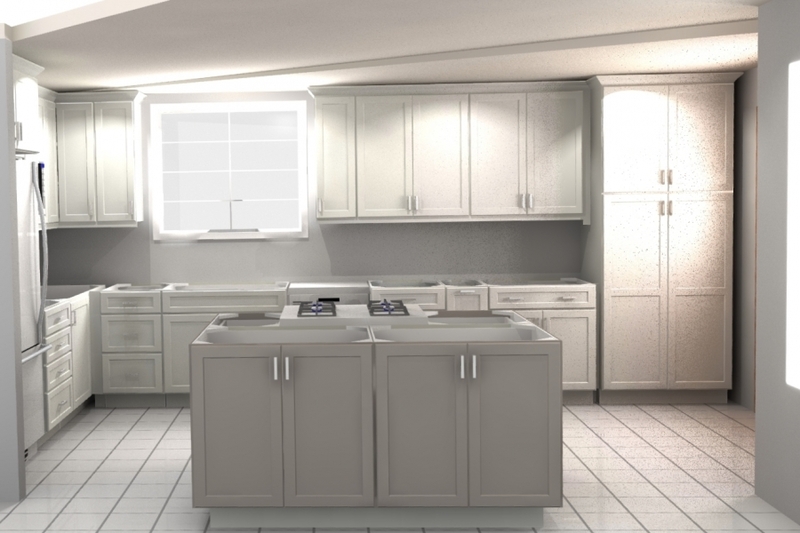 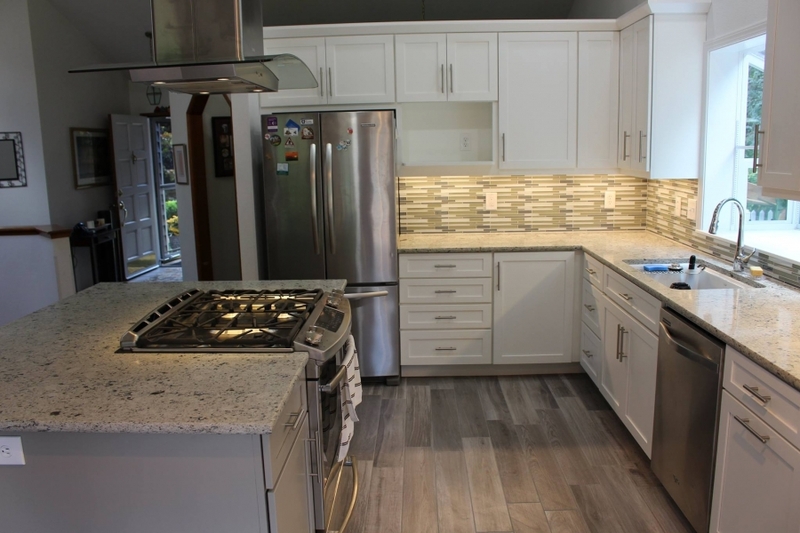 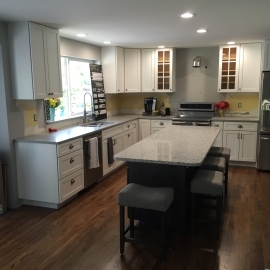 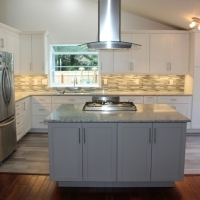 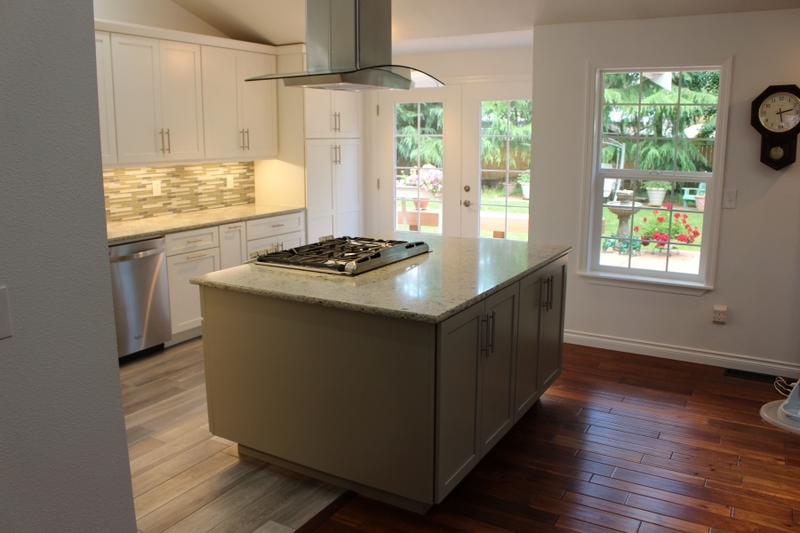 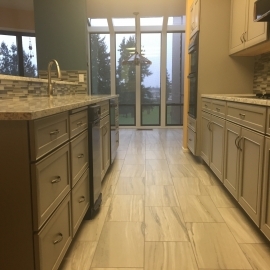 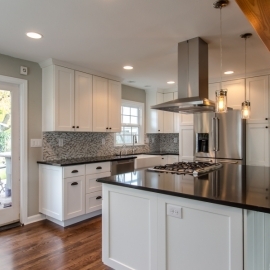 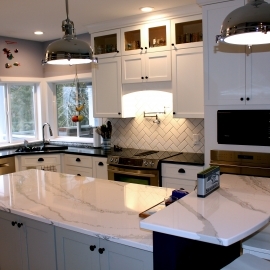 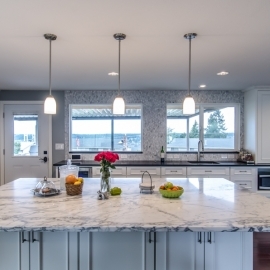 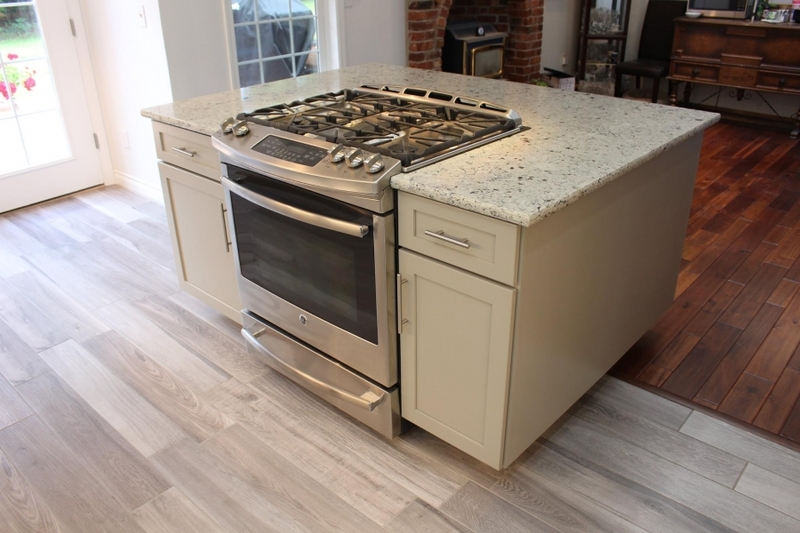 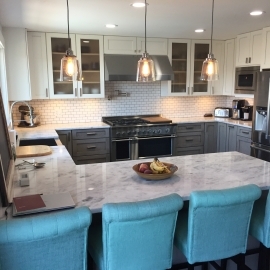 With over 165 colors of maintenance free quartz counters in our Tacoma show room, we were easily able to find something that not only matched the white shaker cabinets and gray island, but also coordinated well with their cherry wood floors. 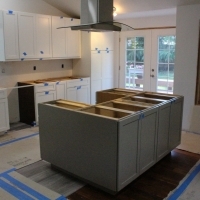 We used a jumbo slab of Pental Serra on the island to eliminate the need for a seam. 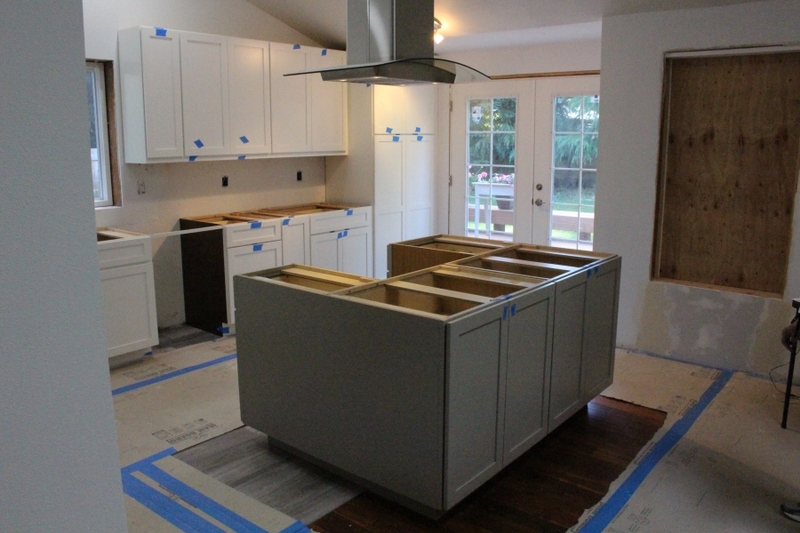 The perimeter countertops are also Pental Serra.